The Samsung Behold has gone through some changes with the sequel version of the handset. 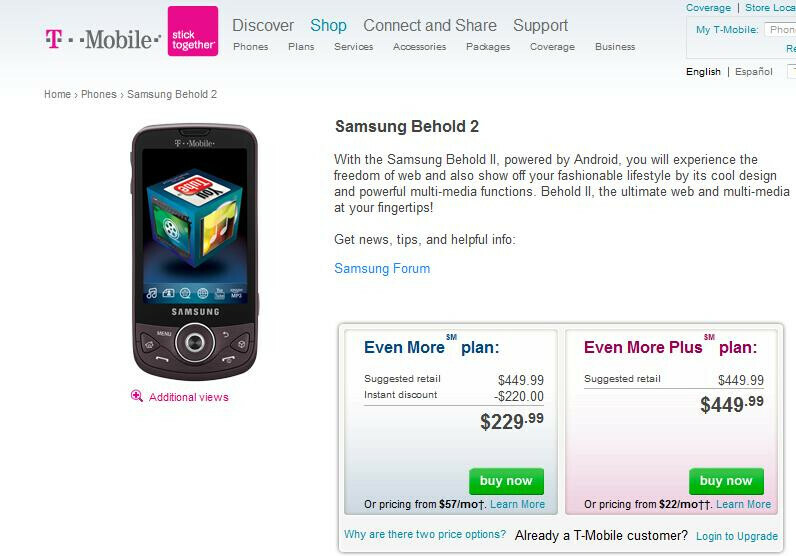 Now powered by Android (Samsung's first such handset for the carrier), the Behold II has been transformed into a smartphone. The touchscreen has grown from the 3 inches on the original to 3.2 inches on the sequel and the latter's AMOLED screen blows away the original's display. At the time the original Behold was released, it was T-Mobile customers first experience with the TouchWiz UI. Touch Wiz is still a feature on the new Behold II as is Wi-Fi and a 5MP camera that sports AF and LED flash. After an Instant Discount of $220, the Behold II will cost you $229.99 with a 2 year contract. If you want to use the "Even More Plus" plan that allows you to pay off the phone monthly, that works out to roughly $22 per month over 20 months. Remember, the non-subsidized price is used for the latter plan. While the original Behold was a featurephone known for the TouchWiz interface and the premium (at the time) 5MP camera, Samsung has seen the future and it is smartphone and Android based. The Behold II is a much different animal than the first-gen unit and this time around should be able to attract those customers seeking a device that offers many features with a brilliant display and a friendly UI. Way too expensive for what it is, even though it has a beautiful AMOLED screen. It's just a Samsung Galaxy with an uglier button layout. Buy a galaxy and you can use 3g internet and all the android goodies with the 6 dollar T-Mobile web plan. You'll save money in the long run. same old specs as the most Android phones on T-Mobile, I have no inclination to pick this one up either over my G1. Its pretty sad that there have been SEVERAL Android phones released on my Network yet NONE of them are really an Upgrade at all, at least enough to justify the price of a new phone purchase. I'm getting really sick of waiting.